Burnley boss Sean Dyche couldn't pick a favourite between a couple of landmark wins against Wolves but stressed that each was important for different reasons. The former Watford manager arrived at Turf Moor as Eddie Howe's successor, winning his first game against Wanderers by a 2-0 scoreline in the Championship. Goals from Martin Paterson and Charlie Austin got the new man at the helm off the mark at the first attempt, silencing a few of the critics that had questioned his appointment. 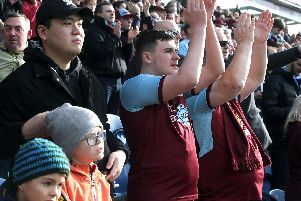 Fast forward to his 300th game in charge of the Clarets where a goal in each half against the same opposition eased fears of relegation from the Premier League. An unfortunate own goal from Wolves skipper Conor Coady got the hosts off to a flyer in the second minute while England Under 20 international Dwight McNeil netted for the second game in succession. After moving five points clear of rivals Cardiff City, who entertain Chelsea in the Welsh capital tomorrow, Dyche said: "The first one was important, of course, it was my first win in my first game after not being flavour of the month to come here. "About 50% wanted me, I'm probably doing myself a favour there. Maybe it was 60/40. It was important to get off to a good start at that time, 300 games ago. Today was a different importance. "It's a strange situation to be in. We'd lost four, that makes a story, but we won today and that probably changes the story. "It reminds everyone that we've got 21 points, which is a healthy return from 13 games. We've got to do more but at Christmas we had 12 points from 19 games. "I'm actually really pleased with how myself, the staff and the players have tuned in to this second half of the season and not over thought anything. "We knew we had more and now we've delivered more but we've got to keep doing that. That's a really pleasing sign today that the mentality is strong enough to accept a really tough one to take against Leicester, have a break, come back clear-minded and win."